Microbial rhodopsins are highly useful as optogenetic tools, as they facilitate controlled ion transport in heterologous cells, e.g. animal neurons. This enables neuronal stimulation or inhibition, and allows to answer questions about the role these neurons play in behavior. Depending on their properties, rhodopsin tools can serve different purposes, e.g. permit flux of different ions, respond to little light, at different wavelengths, etc. We implemented numerous variants of Channelrhodopsin-2 (ChR2) and rhodopsin pumps in Caenorhabditis elegans. 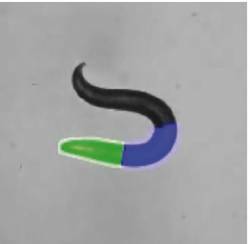 This transparent nematode with a small nervous system is ideal for evaluating and using rhodopsin optogenetic tools in neuroscience. To further modify the rhodopsin properties, we used synthetic retinal analogs, leading to slowed photocycle kinetics and higher light sensitivity. Rhodopsin proton pumps exhibit a low retinal fluorescence that depends on the membrane voltage. We established Archaerhodopsin (Arch) as a voltage sensor in C. elegans and increased its fluorescence by retinal analogs. Last, we used rhodopsin pumps and channels to analyze a neuronal network regulating C. elegans navigation. This network utilizes neuropeptides and neuromodulators. We analyzed functions of distinct peptides and their receptors in this network and in locomotion behavior, by rhodopsin-based optogenetics and other methods. 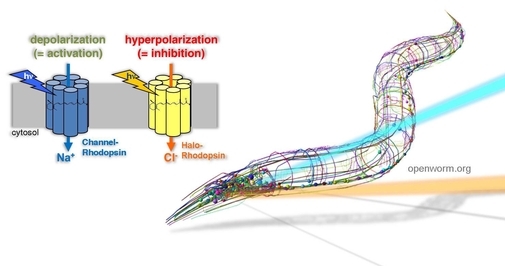 In the next funding period, 1) we will finalize establishment of rhodopsin-based voltage sensors, that ultimately shall be usable at moderate light intensities, compatible with behavior in non-restrained C. elegans, using optimal combinations of rhodopsin variant and retinal analog. 2) We will continue our analysis of the neuropeptide signaling network surrounding the AVK neuron. We will analyze neuropeptides and their receptors that we identified by mRNA profiling of the AVK neuron, and of neurons that express receptors for the FLP-1 peptides released by AVK. 3) We recently introduced CyclOp, a novel type of rhodopsin, i.e. a light-driven guanylyl cyclase, as a new optogenetic tool to induce cGMP 2nd messenger signaling. CyclOp contains a cyclase domain, an N-terminal cytosolic domain and an additional N-terminal TM helix, very unusual for a rhodopsin. We will perform a structure-function analysis of CyclOp, in collaboration with biochemists and spectroscopists in the CRC 807, to clarify the interaction of rhodopsin and guanylyl cyclase domains, as well as the role of the N-terminus. We will alter CyclOp properties by using retinal analogs, and mutate it into a membrane-localized adenylyl cyclase (AC). This will provide an important tool, as currently available light-driven ACs are soluble proteins, yet cAMP signaling in eukaryotes generally occurs downstream of membrane-intrinsic ACs. Our work contributes new avenues to using and understanding rhodopsin pumps, channels, and enzymes, to analyze and manipulate neuronal activity in animal models. 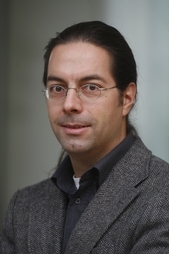 Gao S#, Nagpal J#, Schneider M, Kozjak-Pavlovic V, Nagel G*, Gottschalk A* (2015) Optogenetic manipulation of cGMP in cells and animals by the tightly light-regulated guanylyl-cyclase opsin CyclOp. Nat Commun 6, 8046. Butler VJ, Branicky R, Yemini E, Liewald JF, Gottschalk A, Kerr R, Chklovskii D, Schafer WR (2015) A consistent muscle activation strategy underlies crawling and swimming in Caenorhabditis elegans. J R Soc Interface 12(102):20140963. Cohen E, Chatzigeorgiou M, Husson SJ, Steuer Costa W, Gottschalk A, Schafer WR, Treinin M (2014) C. elegans nicotinic acetylcholine receptors are required for nociception. Mol Cell Neurosci 59C, 85-96. Smith CJ, O’Brien T, Chatzigeorgiou M, Spencer WC, Feingold-Link E, Husson SJ, Hori S, Mitani S, Gottschalk A, Schafer WR, Miller D (2013) Sensory neuron fates are distinguished by a transcriptional switch that regulates dendrite branch stabilization. Neuron 79, 266-280. Kittelmann M#, Liewald JF#, Hegermann J, Schultheis C, Brauner M, Steuer Costa W, Wabnig S, Eimer S*, Gottschalk A* (2013) In vivo synaptic recovery following optogenetic hyperstimulation. PNAS 110, E3007-E3016. Akerboom J, Carreras Calderon N, Tian L, Wabnig S, Prigge M, Tolö J, Gordus A, Orger MB, Severi KE, Macklin JJ, Patel R, Pulver SR, Wardill TJ, Fischer E, Schüler C, Chen T-W, Sarkisyan, KS, Marvin JS, Bargmann, CI, Kim DK, Kügler S, Lagnado L, Hegemann P, Gottschalk A, Schreiter ER, Looger LL (2013) Genetically encoded calcium indicators for multi-color neural activity imaging and combination with optogenetics. Front Molec Neurosci 6, 2. Erbguth K, Prigge M, Schneider F, Hegemann P and Gottschalk A (2012) Bimodal activation of different neuron classes with the spectrally red-shifted channelrhodopsin chimera C1V1 in Caenorhabditis elegans. PLoS ONE 7, e43164. Schmitt C, Schultheis C, Pokala N, Husson SJ, Liewald JF, Bargmann C, Gottschalk A (2012) Specific expression of channelrhodopsin-2 in single neurons of Caenorhabditis elegans. PLoS ONE 8, e43164. Husson SJ, Liewald JF, Schultheis C, Stirman JN, Lu H, Gottschalk A (2012b) Microbial light-activatable proton pumps as circuit breakers to functionally dissect neuronal networks in C. elegans. PLoS ONE 7, e40937. Husson SJ, Steuer Costa W, Wabnig S, Stirman, JN, Watson JD, Spencer WC, Akerboom J, Looger LL, Treinin M, Miller III DM, Lu H, Gottschalk A (2012a) Optogenetic analysis of a nociceptor neuron and network reveals modulatory ion channels acting downstream of nociceptive sensors. Curr Biol 22, 743-752. 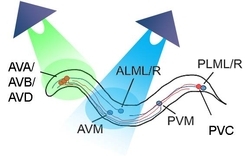 Stirman JN, Crane MM, Husson SJ, Gottschalk A, Lu H (2012) A multispectral optical illumination system with precise spatiotemporal control for the manipulation of optogenetic reagents. Nat Protocols 7, 207-220.